The first crested canary--a canary bird with a crest--is thought to have arisen around 1800. ...arose with crests at about the same time. Using these canaries with crests, breeders in England sought to develop and enlarge the crest and eventually ended up with the crested Lancashire and crested Norwich canaries. As breeders continued to enjoy the development of this crested bird by crossing the Norwich and Lancashire together...they soon developed canary birds that differed in many respects from the Norwich and Lancashire. As they learned more and more about canary care and keeping birds healthy, plus breeding strategies, they were successful in creating their own breed. A large heavy set bird, this canary was soon used to create the Gloster...a much smaller canary with a crest. Even though the Gloster canary was not known as a great singer it became very popular while the Crested Canary breed fell away to a small amount of breeders that remained interested. A canary with a crest is called a "Corona" and a canary--within the same variety of canary--without a crest is called a "Consort". 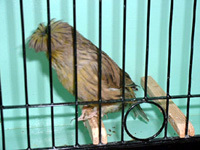 Find a breeder of the Crested Canary...click here. For more on the Crested Canaries visit here.